Putting into practice my concern for small local businesses, I had a good look around Antiquités – Brocante – Militaria just round the corner from the Cachot in Lourdes. The shop must have over a hundred old Latin-French hand missals, including several four-volume Paroissiens. These were books that helped people participate actively in the Liturgy, not by reading a Bidding Prayer in one of five languages through a microphone, but by drawing spiritually from the texts of the Church’s traditional public prayer. Everybody knew in those days that the Liturgy of the Church was not only the Mass, but also the Divine Office, which was regularly celebrated in parishes. 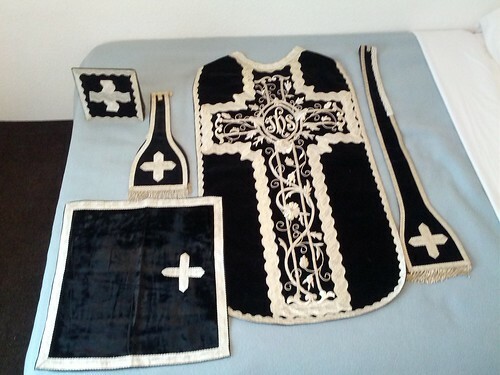 The vestment is a full five-piece black Low Mass set in good condition. 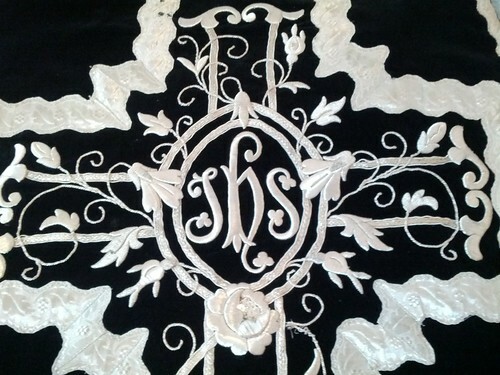 The black cloth is velvet, and the decoration is cloth of silver. The price was 350 euro which I didn’t haggle over. 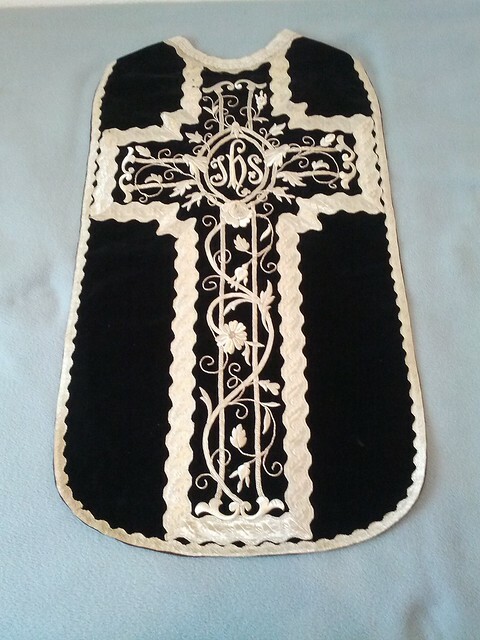 I follow the monitions of St Francis de Sales in that respect, but in any case, I think I would have had to pay quite a bit more if I had bought this in England. At the same time, I guess that it was probably the owner’s biggest single item sale for a while, and I was happy to pay cash, so it was an all-round win-win deal. We were certainly both smiling when we parted company.